Aim and Objective: The hydrosilylation reaction of carbonyl compounds has emerged as a powerful method in organic synthesis. The catalytic hydrosilylation of ketones is a valuable transformation because it generates protected cyanosilylation reaction of carbonyl compounds is an efficient procedure for the synthesis of silylated cyanohydrins, which are readily converted into useful functionalized compounds, such as cyanohydrins, α-hydroxy acids, β-amino alcohols and other biologically active compounds. 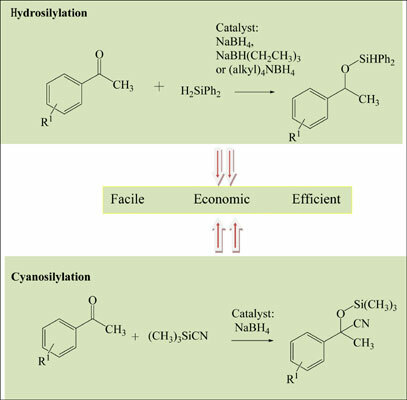 Materials and Methods: A facile, economic and efficient method has been developed for the hydrosilylation and cyanosilylation of ketones using metal borohydrides. A series of silylated ethers and silylated cyanohydrins can be isolated via direct distillation. Results: The catalytic properties of a range of metal borohydrides in the hydrosilylation reaction of acetophenone with diphenylsilane were investigated. The relative catalytic activity of the borohydride catalyst studied was as follows: (CH3)4NBH4> (PhCH2)(CH3)3NBH4> (CH2CH3)4NBH4> (CH3CH2CH2CH3)4NBH4> NaBH4> KBH4> LiBH4. The cyanosilylation of acetophenone using trimethylsilyl cyanide (TMSCN) in the presence of NaBH4 occurred under similar reaction conditions. An excellent reaction rate and high conversion were obtained. Conclusion: The metal borohydride-catalyzed hydrosilylation alcohols in one step. The and cyanosilylation of ketones could be carried out smoothly under mild reaction conditions. Among the metal borohydrides studied, an excellent reaction rate and high conversion were obtained using NaBH4, NaBH (CH2CH3)3 or (alkyl)4 NBH4 as the reaction catalyst. Hydrosilylation, cyanosilylation, ketone, borohydride, metal borohydrides, organic synthesis.